IQAir HealthPro Plus Air Purifier New Edition - Pricey but Worthy? Home » Air Purifiers » IQAir HealthPro Plus Air Purifier New Edition – Pricey but Worthy? IQAir HealthPro Plus Air Purifier New Edition is a mighty beast among air purifiers and today we are going to dissect it to see is it worth its price. It is a new edition of highly praised IQAir HealthPro Plus Air Purifier which got numerous positive reviews. It was designed, tested and certified in Switzerland. It is said that no air purifier can match IQAir’s HyperHEPA filtration system which is used by IQAir HealthPro Plus air purifier. It successfully removes dust, dander, mold spores, pollen and low-level gasses and odors. It removes particles as small as 0.003 microns (the world’s smallest particle) with a guaranteed minimum efficiency of over 99.5%. That’s 100 times better than what can be achieved by ordinary HEPA technology. IQAir’s uses advanced V5-Cell gas and odor technology. That results in the world’s most efficient air purification system. IQAir HealthPro Plus Air Purifier New Edition has six fan speeds. After one month of use, this IQAir unit earns my highest recommendation. I researched air purifiers for about a week before buying two IQAir units, one with the odor filter (Pro-Plus), and one without (Pro) to help with allergies and asthma symptoms that my family suffers from. Both of them work absolutely perfectly, with significant symptom relief within the first week of use. But that’s not all. IQAir New Edition HealthPro Plus is constructed with the highest quality, non off-gassing ABS plastics. And to make using your HealthPro Plus convenient from anywhere in the room, IQAir HealthPro comes with handheld remote control. Up to 25% more clean air, up to 38% longer filter life and even more silent. It was designed, tested and certified in Switzerland. It is said that no air purifier can match IQAir’s HyperHEPA filtration system. The remote controller should be standard equipment in air purifiers. Unfortunately, that is not always the case, so thumbs up for the remote controller. It is also very easy to move IQAir HealthPro Plus air cleaner as it has wheels. Another must have an option with larger air purifiers. So, if you need to move it from room to room, that will not be a problem. All this sounds great, and you probably wonder what’s the catch. Yeah, you wonder correctly. The catch is its price. It costs about $899. Is IQAir HealthPro Plus air purifier really worth the money and could it be possibly the best air purifier currently? Read to find out! Internal leakage in air purifiers can drastically reduce the actual efficiency. IQAir systems use patented triple sealing technology. The unique process ensures that the filter media is 100 percent sealed in the filter frame. Patented 3D UltraSeal ensures perfect knife-edge-in-groove sealing between filter frame and housing. And individual seals on each housing module ensure an airtight housing. That results in total system efficiency that is more efficient than in conventual air purifiers. It works, it’s powerful enough, the filters seem to be high quality and intelligently designed… I did a lot of research online, and I’m glad I did, the world of air purifiers is a confusing one. But this has not disappointed. The New Edition of IQAir HealthPro Plus air purifier features more powerful fan which brings better air cleaning results and should last longer. One of the highlights of the IQAir New Edition HealthPro Plus is its excellent and efficient performance. With the 4-Stage filtration system, this unit manages to remove almost all the airborne pollutants in the house. It can remove large particles like pollen or pet dander to ultra fine ones including viruses and bacteria. Removing particles will provide cleaner and fresher air. The filtration system is combined of 4 filtration parts. The micro-particle filtration, the granular activated carbon adsorption, the pelletized chemisorptions and hyper-HEPA filtration. Although equipped with the Hyper-HEPA filter, it does not produce any ozone. That is always good as some studies say that ozone can damage lungs. The IQAir HealthPro Series features HyperHEPA filtration technology for superior airborne particle removal. IQAir’s HyperHEPA filtration is tested and certified by an independent third-party lab to effectively filter harmful ultra-fine pollution particles down to 0.003 microns in size. This is 100 times smaller than what is achieved with ordinary air filtration technology and ten times smaller than a virus. 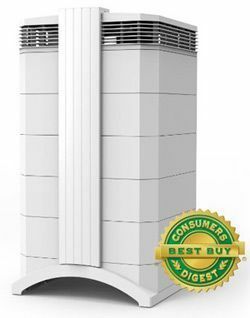 The IQAir HealthPro Plus Air Purifier New Edition fans create enough airflow to clean the air in a 1000 square foot room, and it operates with minimum noise. It also features the V-5 Cell, the most advanced gas and odor control filter on the market. While most air cleaners use only activated carbon pads, the V-5 Cell combines two-stage granular filtration with the airflow advantage of its V-shaped chambers. The activated carbon removes gaseous molecules by a physical process called “adsorption,” which physically binds the molecules within its porous carbon structure. The second part of the HealthPro Plus is unique gas and odor filter. This filter physically binds selective contaminant molecules and then chemically destroys them through an oxidation process. IQAir’s two-stage gas filtration provides excellent wide-range removal of chemicals and odors such as tobacco smoke and cooking odors. In the final filtration stage, air passes through HyperHEPA filter. A patented 3-D sealing mechanism called 3-D ultra-seal ensures that all air drawn in by the air cleaner passes through the HyperHEPA filter. This virtually eliminates the leakage that can cause a 50% drop in performance in other air cleaners. It filters allergens, viruses, and bacteria. How IQAir HealthPro Plus Air Purifier Works? (1) PreMax Pre-Filter: Air is drawn in at the bottom of the system and into the pre-filter. The PreMax pre-filter eliminates coarse and fine micro-particles such as pollen, pet dander, and mold spores. (2) & (3) V5-Cell Advanced Gas and Odor Control: The two-stage V5-Cell gas and odor filter uses dual media to filter a wider spectrum of VOCs (volatile organic compounds) that cause odors and other harmful chemical vapors such as formaldehyde. GAC (granular activated carbon) adsorption and pelletized chemisorption work together to go beyond conventional activated carbon filters found in ordinary air purifiers. (4) HyperHEPA Filtration: The unequaled IQAir HyperHEPA filter eliminates fine and ultrafine particles, including bacteria, viruses and combustion particles (like highway exhaust and smoke). The clean air is then expelled through the EvenFlow diffuser and distributed throughout the room. IQAir HealthPro Plus Air Purifier New Edition comes with a remote controller. You can turn on or off the air purifier whenever you are at the house or select the fan speed according to your needs. There are six fan speeds. When not in use, the remote control can just be fixed in the recesses on the top of the unit, therefore it would be easy to find next time when you use it. Every IQAir room air purifier features six fan speeds, and its streamlined system controls allow you to program automatic operation via day/night timer easily. This allows you to cut energy costs and extend filter life by using your HealthPro Series air purifier to clean the air exactly when you need it. Also, the included intelligent filter life monitor precisely forecasts filter replacement based on actual usage. Color-coded lights tell you when it’s time to change each filter. IQAir HealthPro Plus Air Purifier is indeed quiet when it is in use. You can barely notice the sound when it is set at the first three fan speeds. It is not distracting at all no matter if you are asleep or awake. The sixth fan speed might be a bit louder, especially if you sleep. Taken that into consideration, it is suggested to turn it up to the fastest speed when you are out or doing some easy tasks in the house. Even though the IQAir New Edition HealthPro Plus Air Purifier offers an extremely efficient performance, it still consumes no more power than a traditional light bulb. This air purifier requires as little as 27 watts at the lowest speed while delivers up to nearly 800 cubic feet of the air permit. So you don’t need to be concerned about the costly electricity fee as it is efficient regarding energy. Here is a nice article about estimating energy consumption. When should you buy IQAir HealthPro Plus Air Purifier New Edition? 1. It has several filters that need to be replaced periodically – the prefilter (Est. $50) every 6 -18 months, gas and odor filter (Est. $70) every 1-2 years and the HyperHEPA filter (Est. $150) every 2-4 years. 2. It doesn’t come with all three filters (There are a total of three layers of filter – PreMax Filter F8, V5-Cell Filter MG, and HyperHEPA Filter H12/13). IQAir Health Pro HEPA Air Purifier Filter is absolutely essential to allergy sufferers. These V-shaped filters hold over 5 pounds of carbon mixed with alumina based potassium permanganate in such a manner that air flow is not decreased more than 20 cubic feet per minute when passing simultaneously through them. IQAir Replacement Pre Filter is high-capacity filter with 55% efficiency in capturing irritants as small as 0.3 microns. Weird paint/chemical smell coming from the machine. It is probably the V5 filter (check by taking apart the air purifier and test each filter one at a time in the machine – start with the pre-filter, then add in the V5, then the HEPA). Contact vendor to get a replacement. Unit got stuck at high-speed and would not return to lower speed. Call vendor or in some cases it returns to normal after some time. At highest speed, it is too loud. Well, no solution for that. It all depends on what you find to be loud. Use highest speed setting when you are away from home. After one month of use, this IQAir unit earns my highest recommendation. I have had the IQAir HealthPro Plus running 48 hours now and can noticeably tell the difference in the way our 800 square foot apartment smells and feels, as well as how I feel. This was supposedly a top-of-the-line air cleaner, but I believe it was an overpriced rip-off. The purifier did nothing to improve my child’s allergies. I put it next to my bed at night and can’t sleep without it. Everyone that has come over (including my brother, who has severe allergies and asthma) wants one. They are all amazed at how fast it cleans the air and gets rid of odors. It’s truly an amazing machine! I have owned this unit for 2 1/2 years. It is difficult to say whether this or any HEPA air filter, truly removes allergens. I would highly recommend this to anyone with allergies. It works more than fantastic and cleans everything including germs out very, very quickly and circulates wonderful clean, healthy air. It seems like it costs a lot, but if you have allergies, COPD or asthma, then it cannot be beaten. The IQAir New Edition HealthPro Plus gets rave reviews from experts and owners alike for its superior allergen-removal capabilities. Recent upgrades to the IQAir HealthPro models mean these units can remove particles even smaller in size than standard HEPA filters can handle. The Plus portion of this unit is the addition of a V5 filter for odor and chemical removal. Though this version is quieter, some reviewers say it still gets pretty loud on the highest setting. Upgrades make a great product even better. Multiple reviews, both professional and owner-written, say the IQAir New Edition HealthPro Plus is the best home air purifier for people with severe allergies or living in areas with dangerous air pollution. IQAir models use a HyperHEPA filter to capture particles tinier than a normal HEPA filter can. IQAir is the educational partner for the American Lung Association and was utilized by the Hong Kong Hospital Authority during the 2003 SARS outbreak. The IQAir New Edition HealthPro Plus comes in sturdy packaging and is easy to set up. The package includes optional casters for moving the unit from place to place easily if needed. A few owners and experts say this air purifier can be loud when running on its highest setting. Most reviews, however, focus largely on the performance of this model, noting that noise is a small trade-off for the advanced filtration and particle removal capabilities the IQAir New Edition HealthPro Plus offers. Many retailers and manufacturers overstate maximum room coverage figures by calculating them with air flow rates measured without filters installed (i.e., fan output) or with low number of air exchanges per hour to properly clean the room. Modern Alchemy Air Purifiers believes in stating the actual delivered air flow rates for the air purifiers we sell, as well as realistic room coverage figures calculated at effective air cleaning levels. Accordingly, we recommend that the IQAir HealthPro Plus be used in rooms of up to 285 sq. ft. (for severe allergies, asthma or mold sensitivities) or 565 sq. ft. (for general purpose filtration). Also, note that air purifier performance should not be judged by air flow rates and room maximums alone. Many features that make an air purifier more efficient at cleaning the air actually reduce the air flow rate. For example, higher grade HEPA filters, well-sealed filtration systems and large amounts of carbon all increase air resistance and reduce delivered air flow rates. Upgrades over the previous IQAir HealthPro Plus have made the New Edition version 32 percent quieter. IQAir New Edition HealthPro Plus is expensive, and it has several filters that need to be replaced periodically: the prefilter (Est. $60) every six to 18 months, gas and odor filter (Est. $90) every one to two years and the HyperHEPA filter (Est. $190) every two to four years. A few reviews point out that because the filters are all on different replacement schedules, it does offset the cost of having to replace multiple filters simultaneously. The IQAir HealthPro Plus New Edition Air Purifier is simply the best unit for allergies and asthma as well as being the best all-purpose air purifier for maintaining a healthy indoor environment. Honeywell 17000 S True Hepa Air Purifier - Worth Money?